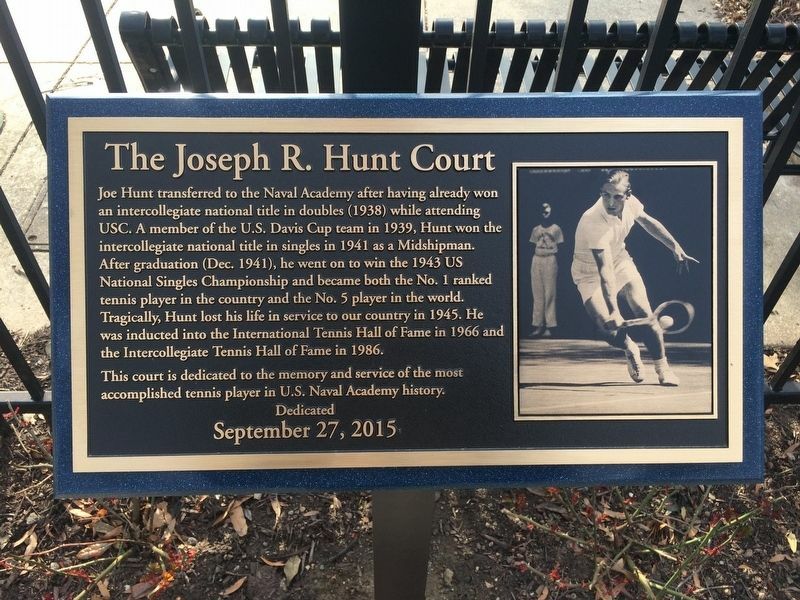 Joe Hunt transferred to the Navy Academy after having already won an intercollegiate national title in doubles (1938) while attending USC. A member of the U.S. Davis Cup team in 1939, Hunt won the intercollegiate national title in singles in 1941 as a Midshipman. After graduation (Dec. 1941), he went on to win the 1943 US National Singles Championship and became both the No. 1 ranked tennis player in the country and the No. 5 player in the world. Tragically, Hunt lost his life in service to our country in 1945. 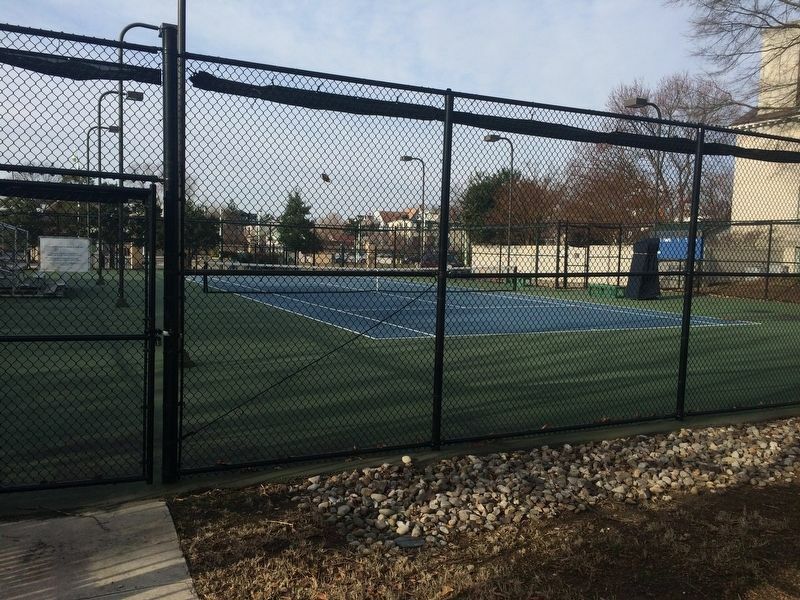 He was inducted into the International Tennis Hall of Fame in 1966 and the Intercollegiate Tennis Hall of Fame in 1986. 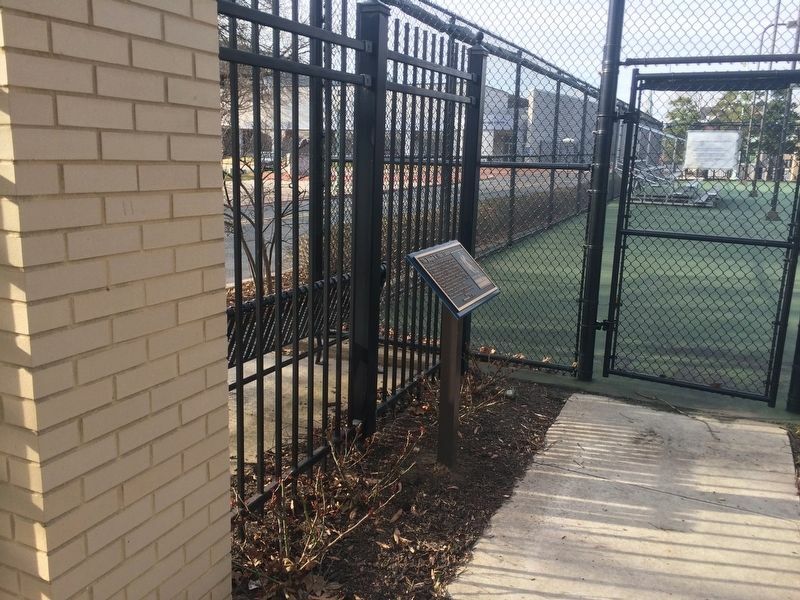 This court is dedicated to the memory and service of the most accomplished tennis player in U.S. Naval Academy history. Erected 2015 by United States Naval Academy.
. On the grounds of the United States Naval Academy. Marker is at or near this postal address: 121 Blake Road, Annapolis MD 21402, United States of America. Touch for directions. Other nearby markers. At least 8 other markers are within walking distance of this marker. The Navy Mascot (a few steps from this marker); N* (a few steps from this marker); Lieutenant General John Archer Lejeune (within shouting distance of this marker); United States Naval Academy (within shouting distance of this marker); Greg Harlin's John Paul Jones's Ranger (about 300 feet away, measured in a direct line); Commodore John Barry (about 500 feet away); a different marker also named Commodore John Barry (about 700 feet away); 75mm. Howitzer (about 700 feet away). Touch for a list and map of all markers in Annapolis. More. Search the internet for The Joseph R. Hunt Court. Credits. This page was last revised on March 17, 2019. This page originally submitted on March 10, 2018, by Devry Becker Jones of Washington, District of Columbia. This page has been viewed 61 times since then and 6 times this year. Photos: 1, 2, 3. submitted on March 10, 2018, by Devry Becker Jones of Washington, District of Columbia. • Bill Pfingsten was the editor who published this page.